"Trusteeship" redirects here. For other uses, see Trusteeship (disambiguation). Trustee (or the holding of a trusteeship) is a legal term which, in its broadest sense, is a synonym for anyone in a position of trust and so can refer to any person who holds property, authority, or a position of trust or responsibility for the benefit of another. A trustee can also refer to a person who is allowed to do certain tasks but not able to gain income. Although in the strictest sense of the term a trustee is the holder of property on behalf of a beneficiary, the more expansive sense encompasses persons who serve, for example, on the board of trustees of an institution that operates for a charity, for the benefit of the general public, or a person in the local government. A trust can be set up either to benefit particular persons, or for any charitable purposes (but not generally for non-charitable purposes): typical examples are a will trust for the testator's children and family, a pension trust (to confer benefits on employees and their families) and a charitable trust. In all cases, the trustee may be a person or company, whether or not they are a prospective beneficiary. Carry out the expressed terms of the trust instrument  - A trustee is bound to act in accordance with the terms of the trusts upon which he or she holds trust property, and commits a breach of trust if he or she departs from the terms of the trust. However, a trustee may act otherwise than in accordance with the terms of the trust if all beneficiaries, being sui juris and together absolutely entitled, direct the trustee to do so (or so consent). If any question arises as to the constriction of the provisions of the trust, the trustee must approach the court for determination of the question. Be impartial among beneficiaries - the trustee must act impartially between individual beneficiaries as well as between different classes of beneficiaries. Account for actions and keep beneficiaries informed, these include a duty to inform beneficiaries as to their entitlements under the trust and other matters concerning the trust. Trustees do not have priority right to trust documents; it is a personal right and cannot be assigned The right to seek disclosure of trust documents is an aspect of the court's inherent jurisdiction to supervise the administration of trusts. As trustees as not under a duty to disclose their reasoning in applying a trust power (unless the trust instrument requires otherwise), there is no duty to disclose any documents dealing with the decision making promise. Protection of confidentiality has been described as 'one of the most important limitations on the right to disclose of trust documents'. 'Memoranda or letter of wishes' do not necessarily need to be disclosed to a beneficiary if they are of a number of potential beneficiaries. The modern interpretation of fiduciary duty requires the consideration of environmental, social, and governance (ESG) factors as these are long-term investment value drivers. When evaluating whether or not an institutional investor has delivered on its fiduciary duties, both the outcomes achieved and the process followed are of critical importance. The terms of instrument that creates the trust may narrow or expand these duties—but in most instances they cannot be eliminated completely. Corporate trustees, typically trust departments at large banks, often have very narrow duties, limited to those the trust indenture explicitly defines. 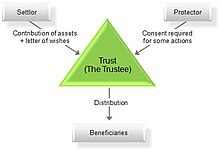 A trustee carries the fiduciary responsibility and liability to use the trust assets according to the provisions of the trust instrument (and often regardless of their own or the beneficiaries' wishes). The trustee may find himself liable to claimants, prospective beneficiaries, or third parties. In the event that a trustee incurs a liability (for example, in litigation, or for taxes, or under the terms of a lease) in excess of the trust property they hold, they may find themselves personally liable for the excess. Trustees are generally held to a "prudent person" standard in regard to meeting their fiduciary responsibilities, though investment, legal, and other professionals can, in some jurisdictions, be held to a higher standard commensurate with their higher expertise.-Trustees can be paid for their time and trouble in performing their duties only if the trust specifically provides for payment. It is common for lawyers to draft will trusts so as to permit such payment, and to take office accordingly: this may be an unnecessary expense for small estates. The broadest sense of the term trustee applies to someone held to a fiduciary duty similar in some respects to that of a trustee proper. For example, the directors of a bank may be trustees for the depositors, directors of a corporation are trustees for the stockholders and a guardian is trustee of his ward's property. Many corporations call their governing board a board of trustees, though in those cases they act as a board of directors. In the case of UK charities, a trustee is a volunteer who undertakes fiduciary responsibilities on behalf of the charity, subject to the provisions of Charity Law, a branch of trust law, and the Charities Act 1993. For charity trustees, the Charity Commission of England and Wales, Office of the Scottish Charity Regulator of Scotland and Voluntary Activity Unit of Northern Ireland often has concurrent jurisdiction with the courts. Many UK charities are also limited liability companies registered with Companies House, in this case the trustees are also directors of the company and their liability is limited. This is the preferred model if the charity owns property or employs people. The law on this in England changed considerably with the Charities Act of 2006. An account of the main changes can be found in "Charities Act 2006 A guide to the new law" by Michael King and Ann Phillips[who?]. One of the key changes made was that it introduced the Charitable Incorporated Organisation which is basically a limited liability charity. There are thus now two main aspects of corporate management of charities. One is the traditional way in which a corporation is a corporate trustee of a given charity. The second is the new way, in which the charity itself is incorporated as a CIO. The advantages and disadvantages of the different methods is a complicated matter. According to King and Philips, many of the advantages of incorporating as a CIO are obtained if the trustees are not individuals but a corporate entity. Depending on the state, a trustee is a member of the village board of trustees, which is a village's elected legislative body as outlined by local or state law. It can be composed of the mayor and a set number of trustees and usually manages village property, finances, safety, health, comfort, and general welfare and leadership of the town (acting as a board of police or fire commissioners or a moderate income housing board for example). Village board of trustees is comparable to but distinguished from city council or town council. Small villages have a trustee instead of a mayor, who is elected to manage village business in a similar function. In some states, a civil township may be administered by a trustee or a group of trustees; see Indiana Township Trustee for an example. In this context, a "trusty" is a prisoner who is trusted not to attempt an escape, and therefore requires little or no guarding. For example, a trusty may be allowed to leave the prison to attend work or other important events. Many times, "trusty" is misspelled as "trustee". In the United States, when a consumer or business files for bankruptcy all property belonging to the filer becomes property of a newly created entity, the "bankruptcy estate". (See 11 U.S.C. § 541.) For all bankruptcies (consumer or business) filed under Chapter 7, 12 or 13 of Title 11 of the United States Code (the Bankruptcy Code), a trustee (the "trustee in bankruptcy" or TIB) is appointed by the United States Trustee, an officer of the Department of Justice that is charged with ensuring the integrity of the bankruptcy system and with representatives in each court, to manage the property of the bankruptcy estate, including bringing actions to avoid pre-bankruptcy transfers of property. In bankruptcies filed under Chapter 11, the debtor continues to manage the property of the bankruptcy estate, as "debtor in possession," subject to replacement for cause with a trustee. Chapter 7 trustees in bankruptcy are chosen by the United States Trustee from a panel, and are known as panel trustees. Every judicial district has a permanent Chapter 13 trustee, known as a "standing trustee." As cases under Chapter 12 (for family farmers or fishermen) are filed fairly infrequently, the United States Trustee usually makes trustee appointments in such cases on an ad hoc basis. Trustee Delegation Act 1999 specifically covers matters to do with land. Look up trustee in Wiktionary, the free dictionary. ^ a b Black's Law Dictionary, Fifth Edition (1979), p. 1357, ISBN 0-8299-2041-2. ^ "The New Palgrave Dictionary of Economics and the Law, Definition of "fiduciary duties" by Tamar Frankel Vol.2, p.127-128". Harvard Edu. Retrieved 2011-09-08. ^ Youyang Pty Ltd v Minter Ellison Morris Fletcher  HCA 15, (2003) 212 CLR 484 (3 April 2003), High Court (Australia). ^ Breen v Williams ("Medical Records Access case")  HCA 57, (1996) 186 CLR 71 (6 September 1996), High Court (Australia). ^ Trustee Act 1925 (NSW) ss14, 14A & 14C. ^ Tanti v Carlson  VicLawRp 70 (2 April 1948), Supreme Court (Vic). ^ "CC3 - The Essential Trustee: What you need to know". Charity-commission.gov.uk. 2008-04-01. Retrieved 2012-03-05. ^ Text of the Charities Act 1993 as in force today (including any amendments) within the United Kingdom, from legislation.gov.uk.